What trends do you see in energy monitoring? In today’s environment, customers are looking for real time energy monitoring and reporting capabilities. End-users are looking for tangible statistics to understand their actual energy consumption, create base-line data sets of the energy usage of the equipment they use, and make accurate decisions about how to control consumption. Due to the growing need to understand real-time energy consumption, plug load usage is one of the fastest growing concerns of end-users. Traditional energy management solutions are algorithm-based and pull their data from meters at the branch panel. These solutions only provide estimations, and do not allow the user to understand exactly what devices are being used, when they are being used, and/or which electronics are inefficient that can be targeted for capital upgrades. They also do not enable users to actively manage and control individual plug-level usage to strategically reduce a facility’s operating costs and adjust for time of usage billing. Therefore, alternative solutions that provide accurate, real-time data and go beyond traditional algorithm-based branch circuit estimations, is a new trend in energy monitoring. Another trend in energy monitoring is scheduling. Clients are looking for proactive technology to be able to deploy automatic hardware time sequencing. Being able to control and run custom schedules at the plug level via to turn units off at night, on the weekends, or schedule time periods when usage is not required is a growing need. Technology that supports sustainability programs are also growing in popularity. The ability to benchmark a company’s actual energy use and deploy green energy initiatives across a business is important in today’s environment. Energy monitoring solutions that provide businesses tools to identify where and how to improve their energy consumption within the facilities they occupy is very valuable. In addition, technology that enables end-users to initiate corporate green action plans and run employee engagement programs to reduce energy consumption is a growing need. The eCommandCenter is the first all-in-one energy management solution of its kind that empowers businesses to monitor and manage actual energy consumption, protect equipment, and implement sustainability programs, down to the plug level. Engineered with wireless energy monitoring technology, industrial grade power protection, diagnostic software, and reporting analytics, the eCommandCenter features a sophisticated package of hardware and software that enables businesses to manage energy costs proactively. 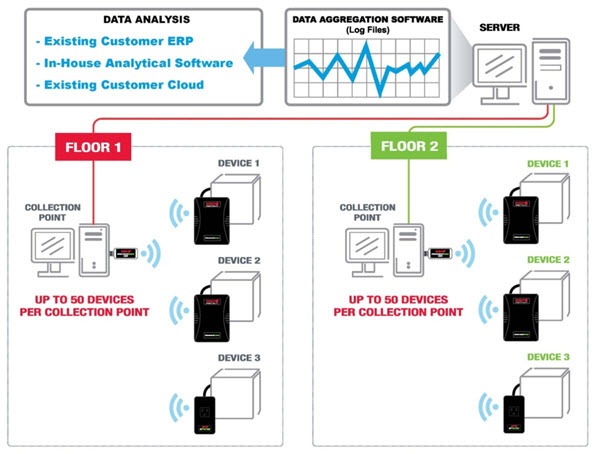 ESP’s new plug-level platform independently tracks the energy consumption of every connected device within a business and gives companies a comprehensive report of specific real-time usage patterns across multiple facilities. It’s the perfect solution to identify specific employees and equipment that consume higher than average energy, eliminate misused energy costs or vampire power, proactively set up automated programs to manage outlet power consumption, report data-driven evidence of energy usage savings at the “plug-level”, and incorporate tangible green business practices. The eCommandCenter includes energy management hardware, software, and a powerful reporting dashboard that tracks the energy consumption of 120 Volt, 15/20 Amp plug-level devices within a business. The platform features hardware that is installed into every outlet within a facility. Each hardware unit has an embedded circuit board that is designed to measure real-time energy usage and record plug level power anomaly data for device troubleshooting. In addition, the hardware also provides world-class, industrial grade surge and noise protection technology that safeguards the reliability of all connected equipment. The eCommandCenter hardware utilizes a two-way Zigby wireless mesh network to communicate. Each eCommandCenter hardware unit communicates energy consumption data wirelessly back to a centralized “collection point” that is centrally installed at the installation facility. 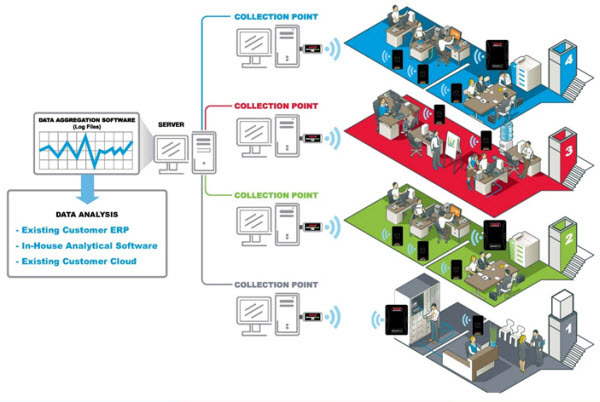 Each collection point tracks the energy consumption data of up to 40 eCommandCenter hardware units. End users are able to track the energy consumption data at each collection point via the eCommandCenter software. The platform’s energy management software is loaded onto an adjacent “server” that enables end-users to manage and monitor the energy consumption of the installed hardware units and collection points. The software also includes powerful macro tools that can enable scheduling and complete management of attached devices. Multiple collection points can be set-up for installations exceeding forty devices and all the data can be consolidated and managed via ESP’s energy management sophisticated software. Depending on the size of a building or installation area, multiple collection points may be required. If wireless communication distances or building obstructions exceed Zigby design parameters for communications, a repeater is available that can extend the mesh network to remote devices that need to be monitored. The eCommandCenter also features additional diagnostic software that enables users to troubleshoot and diagnose power disruptions. The eCommandCenter also allows raw data to be uploaded via a parser uploader tool into excel pivot tables, ERP systems, or other client or vendor created analysis programs. Energy usage data can be analyzed for almost an infinite amount of time, provided computer storage capacity is available. An additional cloud based software dashboard reporting tool is also available as an accessory to the system that has powerful reporting and data collection capabilities if clients do not want to export the data into their existing systems. The eCommandCenter platform can easily be installed in most facilities because it can sit independent from the user’s firewall and does not require an IP address or additional network bandwidth. Since the units are wireless it enables the inclusion of hardware without IP addresses to be part of the energy reporting and control platform. Customers that have energy management and sustainability programs who want to engage their employees and determine actual usage by electronic device, while targeting energy wasters will find this system extremely versatile in this regard. This could include users in an office environment, home applications, audio visual gear not requiring pure surge elimination, servers outside of the data center, facility managers, and any manager tasked to understand plug level energy use in their working environments. This product is also a great business tool for resellers and dealers. The eCommandCenter can provide a new product line, and can enable dealers to offer additional energy management services and energy audits for sustainability reporting. Why combine power protection and energy management? Utility companies world-wide, national agencies (including the National Oceanic and Atmospheric Administration and Commerce Department), electrical standard setting organizations, original equipment manufacturers, and other independent third parties highly recommend using industrial grade surge protection at the plug level for sophisticated electronics. Years of data show that over eighty percent of power anomalies are generated within a building or from a nearby building form electrical units cycling such as pumps, motors, office equipment, elevators, lighting or HVAC units, to name a few. Power quality issues and lightning make up most of these anomalies experienced by businesses. Most devices with sensitive electronics and boards should be protected with some type of true surge protection that goes well beyond what is found in a typical retail outlet. Power anomalies and noise can cause catastrophic failure of electronics, interfere with software and set points, or result in a shorter lifecycle of the hardware. Typical manufacturer warranties for electronics and appliances usually exclude damage caused by surges, lightning, “acts of God for power issues, or noise, both EMI and RFI from their warranties. Embedding energy management into power protection devices gives the user the best of both worlds at the plug. The user can increase uptime, protect data, lower service calls and parts replacement, all while managing energy usage. How is it different from other energy management products out in the market right now? The eCommandCenter monitors actual energy usage down to the plug level, where other systems may use algorithms, device usage estimates, or other non-direct methodologies that can have usage errors. By going down to the device level, one gains better visibility of where opportunities exist to reduce energy, control or upgrade appliances/electronics and create execution plans by employee to lower energy usage–versus at the electrical panel or branch circuit energy management applications, which can only monitor energy consumption system-wide. The platform also provides robust monitoring and diagnostic software that offers a tremendous amount of flexibility and sophistication – unlike other systems. End-users are given the ability to write macros that can turn devices off on the weekend, or after hours, and during peak usage times to lower electricity bills for equipment that are non-essential. In addition, the eCommandCenter is the only solution in the industry that provides industry leading surge protection and diagnostic software to protect from power anomalies. This is a unique feature for this platform. What kinds of equipment can the eCommandCenter monitor? Any plug based device that uses 120 volt 15/20 amp power. This can include water coolers, vending machines, imaging devices, computers, microwaves, refrigerators, audio visual devices, ATM’s, kiosks, standalone plugged lighting, medical devices, space heaters, refrigerators, servers outside the data center, projectors, etc. As long as an installation stays within the voltage and amperage parameters of the unit and circuit, any electrical device can be reported, monitored and controlled at the plug. What are the long term benefits of using the eCommandCenter? Research shows that companies can reduce their energy consumption costs by over 30% if they utilize energy management programs within their business. Further evidence shows that energy saving machine capabilities are not being used correctly, that “old” appliances use more energy than new, that phantom energy usage is a significant problem, hardware is left on when devices should be turned off, certain devices should be replaced or not used at all due to inefficiencies or policy, and all these factors create clear energy saving opportunities. Field research by third parties shows that office users typically waste thirty percent or more of their energy. Based on this framework, we believe a lot of opportunities exist for short and long term energy use improvement. The eCommandCenter gives businesses the tools to understand and track their actual plug-level consumption. The eCommandCenter enables users to collect energy data on a very granular level and allows system managers to look at usage patterns and energy draws to derive a concrete action plan, based on real numbers, to reduce energy consumption and see long-term benefits and cost savings. When integrated into a company’s energy management program we anticipate a thirty percent savings threshold can be realized over time. This platform can enable certain carbon footprint reporting requirements, and as part of an overall sustainability program, other non-financial benefits will accrue too. These benefits include creating shareholder value by minimizing business risk in a volatile energy marketplace by having exact usage, by reporting and measuring energy usage firm’s can minimize societal and employee concerns linked to climate change. As an example, opportunities exist to market results and investments made in the program to core constituencies and business shareholders. Because the eCommandCenter is integrated with world class power protection, businesses will experience long term equipment benefits including, improved reliability, uptime, and extended lifecycles. Does ESP offer any additional energy management products? Yes – the Electronic Systems Protection markets two power protection brands, ESP and SurgeX, which both offer a full line of power protection devices designed to suit the individual needs of its respective market. Our SurgeX technology utilizes a patented design that provides total surge elimination, and is a unique protection technology. SurgeX surge elimination is critical within the audio visual space or other specialty markets where devices can be impacted if surge energy is not fully eliminated. Similar to our ESP brand, SurgeX offers complete energy management and monitoring capabilities via an IP addressable technology, which is different from the eCommandCenter wireless technology. The SurgeX energy management products are marketed under the Axess Elite and Axess SKU’s and they are rack based solutions that have individual outlet sequencing, temperature reporting, energy management capabilities as well as other unique features utilized within the Audio Video industry. In addition, our recently launched SurgeX Cervella unit will connect to any of our Axess devices via a secure protocol enabling full enterprise device management. Additional details can be found at SurgeX.com. Why is it better than other offerings in the market? Our view is that the energy management capability down to the device level, the reporting, software analytics, and macro writing abilities are second to none. In addition, we are not aware of any units today that combine the two worlds of industrial grade power protection and power management all in one self-contained system at the plug-level. What user challenges and problems does the solution solve? How? The eCommandCenter enables management and control of energy down to the device level via real time protocols, ensuring there will be no guessing of who or what device is using energy inefficiently. Actions can then be taken to control, report and improve wasteful habits proactively via employee engagement programs. The outcomes can be clearly documented over time and communicated to key business stakeholders, both internally and externally. This platform can also be used to ensure vendor energy claims are accurate for broad based equipment installations and it can be used to justify to senior management equipment upgrades or change-outs if payback periods can be clearly documented. Depending on electricity pricing, devices that will not impact an operation can be turned off at times of high peak billing hours. We anticipate that as users become familiar with the eCommandCenter technology and its extensive reporting capabilities, people’s creativity and innovation will find numerous other ways to improve their operation and lower energy due to the flexibility of the system. What skills or resources are required to set up the system? An individual with an intermediate IT systems capability and background is typically recommended. This could be any IT professional or individual that has familiarity with system installations of imaging devices, laptops and general technology software platforms. We also recommend that a site survey be conducted up-front to determine which workstations or user devices will be part of the overall solution. This would include how many eCommandCenter units will be required, the power protection needed, and via a kit, the signal strength of the Zigby wireless within the install areas. After this step is completed and the hardware ordered, we counsel that the filter devices be activated via a “conference room pilot” and then brought to the site for installation and plug-in. This prevents any work disruptions and simplifies the process tremendously. In the conference room pilot, the eCommandCenter software is loaded onto a server and the wireless dongle is synchronized to communicate with all the filters needed for the installation. ESP also has several pre-configured bundles that ESP provides to assist customers that require assistance to set up their system. These services range from being a turnkey set-up including activating the Zigby wireless, creating files, shipping synchronized filters, eCommandCenter software pre-loaded on a “server” and a dongle antenna, all based on the site survey specifications. Other less sophisticated set-up options are available depending on customer requirements and capabilities from a technical standpoint. What types of data can the eCommandCenter collect? What can the software do? Energy usage data for attached devices is gathered at user defined time intervals. The raw data includes kilo-watt hours, amperage and voltage and each device can be uniquely uploaded via a parser tool into an existing ERP system, excel database or many other analytical software tools designed for statistical/data analysis. 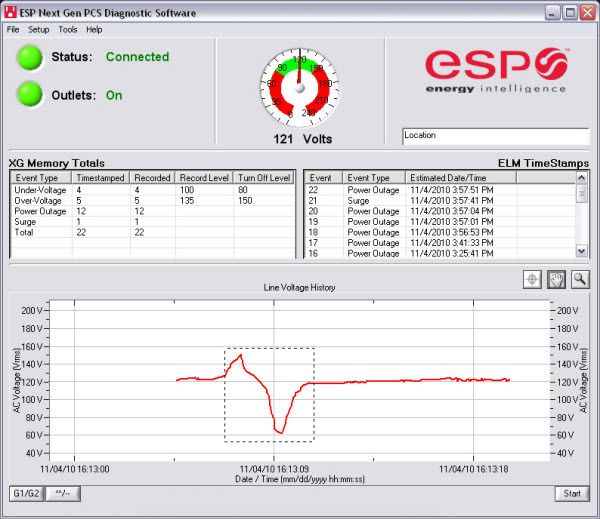 ESP has an accessory dashboard software tool that uploads the raw data/information into a cloud data base with a fully featured capability that shows energy consumption down to the device level in various graphs, comparison charts, by user defined criteria such as a specific office, user name, device, building or floor. 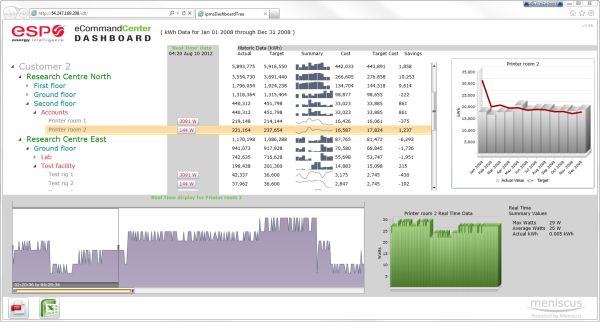 The flexibility of the dashboard enables complete customization and various data cuts depending on the clients’ needs. Do the eCC capabilities include controlling attached equipment – to what level? Yes – specific macro writing capabilities in the software platform enables the user to define when a device should be on or off via custom sequence schedules. Devices can be shut down after a period of time, or when user defined energy use thresholds are reached. Devices can be activated via a customized schedule or from a centralized control point. Units can be prevented from turning on at specific points of the day enabling almost an infinite amount of customization. Yes – the solution is very flexible depending on how a client wants to set-up their overall installation. This could include how many users, offices or buildings will be placed into the program, and what investment the client wants to make for their energy management or sustainability programs. Program owners can decide how and what they want to control, reporting schedules and the type of recording and time intervals to be used in the data collection. Since the system is plug-level it can be moved within a building if the expertise exists to reconfigure. How will the eCommandCenter help in the creation of a sustainability program? Many clients are looking to how employees can be engaged in sustainability and energy management programs. Our platform enables employees to see how they are using energy and where they may be different than their peers or published norms. Devices that may be extremely inefficient or should not be used like space heaters or small refrigerators can be identified, and users can be encouraged to stop using the devices as part of a sustainability program. People will be able to see phantom energy use and they will be able to recognize when they are not turning devices off as they should upon leaving the building or area for extended periods. Workgroup competitions can be created to make the management and sustainability program fun by having data that is real-time and at the device level. If programs and contests can be created to make the targeting entertaining the data can be viewed and acted upon in a non-confrontational manner. The first step in any program is to set an energy use base-line with the eCommandCenter platform. By attaching the eCC hardware to both IP and non-IP addressable devices, almost any piece of hardware can be audited down to the plug level. After monitoring for the appropriate period of time, the data can be gathered, plotted and analyzed to begin to assess where areas of opportunity exist in usage. Comparisons and averages can be set across the enterprise, or even in the home creating the ability to conduct energy saving experiments or macros to save energy. We anticipate that users via the monitoring capabilities will replace or eliminate devices found to be energy hogs. As a sub-set of an overall sustainability and energy management program the eCC will bring to light where waste is occurring. Why is energy management and sustainability important to the market? Energy and its usage is typically one of the largest costs in running a business, other than labor and materials. By understanding usage, one can create programs to improve efficiencies by managing use, upgrading equipment or eliminating non-essential energy drawing devices. The eCommandCenter system enables the creation of real-time data at the plug level than can be acted upon, monitored and controlled. Additionally, employees and shareholders are looking for environmental and social responsibility from businesses. The cost of energy can be volatile creating the need for better understandings on how it is used, people are asking firms to know or install devices that minimize carbon footprints and there is a need to conserve resources. Studies exist providing a large body of evidence that firms that have a systematic and documentable approach to these two objectives enjoy a broad array of both tangible and intangible benefits to employees, customers, vendors and investors. What type of energy savings should be anticipated? The savings anticipated and payback periods will depend on how the eCommandCenter is applied. Studies show that about fifteen to thirty percent or more of the electricity used is usually wasted in office environments. There are two ways to look at energy savings: short term and long term. By using the eCommandCenter to schedule non-essential devices such as copiers, water coolers, etc., to turn off after hours, energy savings can be realized immediately. When looking at the long-term efficiency of a building or system, it will take a time to identify the problem areas and work to correct them. Since so many variable factors are involved, as well as human nature and business management, we believe that every instance will be unique. As an example, research shows that employees deactivate energy saving capabilities on equipment and this tool can find those inefficiencies. If the data is acted upon and macros written or equipment is targeted for replacement that is inefficient, these installs will obviously have higher savings. Once installed, the tool has a long life based on the design and will enable years of usage if properly used further making estimates a challenge. However, even with these considerations consolidating and triangulating numerous energy surveys that exist for the office indicate that about 17.3 kilo-watt hours of electricity are used per square foot annually. If thirty percent is for office hardware and thirty percent of that is wasted, about 1.6 kilo-watt hours per square foo,t is a saving opportunity annually. A typical office building is about 15,000 square feet and at an assumed national electricity cost of 13.4 cents per kilo-watt hour, the savings could be projected to be about $3,200 for a typical office environment. These estimates can, and will, be higher or lower based on how our platform is used and what specific actions are taken to reduce usage. What do you anticipate the payback period to be? Payback periods will depend on installed equipment and numerous variables that are controlled by many different constituencies, so we do not want to provide specific timeframes since many of these factors are undetermined and owned by the user. Based on creating tables of usage for various electronic devices and if the system is used properly and continuously, we do anticipate that a payback period could range from two to five years using a 30 percent energy target savings. Additionally, intangible benefits of the system are numerous too and should be part of any purchase decision. Can it be used in residential environments? If not, do you plan to make a residential offering? Yes – ESP believes the eCommandCenter will find its way into the home via our various dealers and channels of distribution. Based on the technology, we believe that our partners will be the best vehicle to install since the system does have a level of technology that some end-users might find challenging. A professionally trained technician will be able to set-up the system and install in a home quite easily to monitor appliances, set top boxes, home theaters, computers, gaming or security systems. An added benefit will be proper surge and noise protection in this market. Can usage data be integrated into existing analytics systems? Yes – via a parser up-loader the raw data is in a format that can be used with most analytical tools such as an ERP, excel database or other statistical platforms. Any interesting user stories yet? Several customers have reported back surprising and unanticipated usage profiles on certain devices that they felt were very efficient at the start. Some installations found that water coolers and certain types of vending machines are big energy draws, while others use almost two-thirds less. They are upgrading these to more efficient units. In the imaging space claims relative to energy efficiencies and savings have been vetted and actions taken when they were not realized, adding value to both the vendor and customer. We are also hearing from clients that have found some vendor claims on power consumption can be off and that upgrading certain older electronics have justifiable pay back periods. In our own facility we have found some employees using almost twice the amount of energy as their peers, so it created a great friendly competition to be more cognizant of usage.